Abraham Mead was born in 1742 who during the American Revolutionary War served as a Captain, assisting in the defense of New York. Deacon Potter Mead was a prominent citizen of Horseneck, the original name for central Greenwich. He was a commissioned captain in the Revolutionary War, town treasurer, real estate agent, deacon and treasurer of the Second Congregational Church, and one of the first Connecticut potters. As a teenager he was apprenticed to Adam Staats, a Dutchman considered Connecticut’s first stoneware potter. Staats kiln was located just south of the Davis gristmill. According to legend, Deacon Potter Mead, from close observation of Staats, discovered the secret of salt glazing. 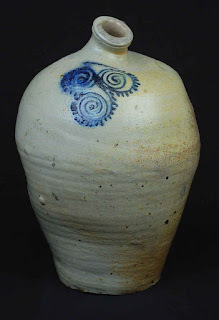 When Staats observed him throwing salt into the kiln, he is said to have exclaimed, “He’ got it! He’s got it!” True or not, Mead is known for his functional stoneware that was sold to the farmers and merchants of the Greenwich area and probably beyond to New York and New Jersey as well. The blue design is typical of his work. For some high resolution photographic examples of his work go to this link. Later in life he served as a deacon in the Second Congregational Church. He died in 1827 and is interred in the cemetery adjacent to the church known as the New Burial Grounds Association Cemetery.